The renal condition is when the kidneys lose their ability to perform basic functions. Renal failure can be acute (ARF) occurs when sudden and rapid loss of renal function, or chronic (CRF), when this loss is slowly progressive and irreversible. As your installation is slow, the body can adapt well until late stages of chronic renal failure. Therefore, it is a silent disease. Many people think they can identify a diseased kidney by pain or decreased urine output. There is nothing more false than that. 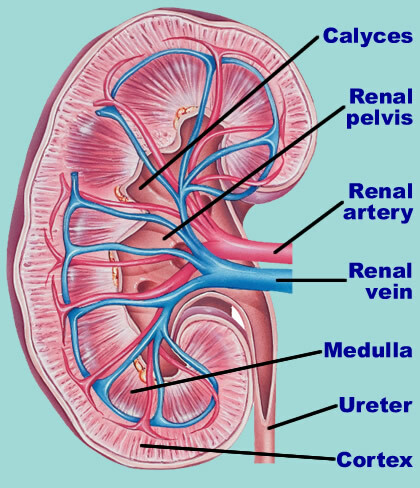 The kidney has little innervation for pain and so it only hurts when it is inflamed or swollen. As in most cases of chronic renal failure the patient may well need dialysis without ever having felt one little pain in the kidneys. The amount of urine is not good indicator. Unlike acute renal failure (ARF) where oliguria (reduced urine) factor is almost always present, in chronic renal failure as loss of function is slow, the kidney adapts well and the ability to eliminate water remains until well advanced stages of the disease. In fact, most patients who come in dialysis still urinate at least 1 liter per day. From these two analyzes, we can identify those with renal failure in early stages and therefore asymptomatic. Without these tests it is impossible to know how good your kidney functions. If you have any of the above diseases, it is essential to do regular monitoring of your creatinine. At least once a year creatine, urea and performing a simple test of urine should be tested. The big problem is that the IRC fact not presented with symptoms until advanced stages does not mean that the disease does not cause complications during this period. The kidney plays several roles in the body, and as the disease progresses, more health problems can arise. Early diagnosis is essential to slow the progression of renal failure and prevent its complications. The two kidneys filter on average 180 liters of blood per day, plus or minus 90 to 125 ml per minute. This is called the glomerular filtration rate or creatinine clearance. Since the average is 100 ml/min, for a better understanding of patients we say that this value corresponds to 100% of renal function. If your doctor says your kidneys function 60%, it means that your kidneys filter roughly 60 ml/min. The stages of chronic renal failure are divided according to the filtration rate, which can be estimated from the values of blood creatinine. Kidney failure is often a progressive disease, worsening function over the years. Some factors such as poorly controlled diabetes and hypertension increases the risk of rapid loss of kidney function. Patients with creatinine clearance greater than 90 ml/min, but with some of the diseases described above (diabetes, hypertension, polycystic kidney etc...). Patients possessing any of these diseases have always some degree of renal injury but may still not influence the ability of blood filtration. These are patients with normal renal function, but at high risk of deterioration. Patients with normal creatinine, but with changes in urinalysis, with signs of bleeding or loss of protein in the urine, also enter this stage. Patients with creatinine clearance between 60 and 89 ml/min. It may be called the pre-renal failure. There are people with little loss of function. In the elderly that does not mean the disease, just a sign of aging kidney. At this stage, the kidney still manages to maintain its basic functions and blood creatinine is still normal. However, it is working at its limit. Patients who are at risk of kidney injury by drugs such as anti-inflammatory and contrast for radiological examinations. Patients with creatinine clearance between 30 and 59 ml/min. This is the stage of declared chronic renal insufficiency. Creatinine is beginning to be elevated and early complications of the disease begin to develop. The kidneys begin to diminish their ability to produce erythropoietin, a hormone that controls the production of red blood cells (RBCs) from the bone marrow, and the patient begins to exhibit its fall in hematocrit, with progressive anemia. Another problem that is emerging is the bone lesion. Patients with renal insufficiency have a disease called renal osteodystrophy, which occurs by the elevation of PTH and the fall in the production of vitamin D, hormones that control the amount of calcium in the bones and blood. The end result is a bone demineralization. 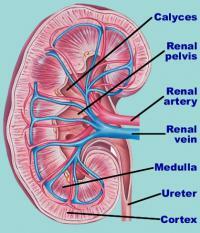 Stage 3 is the stage where patients should start treatment and be observed by a nephrologist. From stage 3 patients usually evolve with progressive loss of renal function. Some faster, some slower. Patients with creatinine clearance between 15 and 29 ml/min. This is the pre-dialysis. This is the time where the first symptoms begin to appear and laboratory analyzes show several changes. The patient has high levels of phosphorus and PTH, established anemia, acidosis (acidic blood), elevated potassium, weight loss and signs of malnutrition, worsening of hypertension, bone weakness, increased risk of heart disease, decreased libido, decreased appetite and tiredness. Due to fluid retention, the patient may not notice the weight loss, since the weight can remain the same or even increase. The patient loses muscle mass and fat but retains liquid and can develop small swelling in the legs. At this stage the patient should already begin to be prepared to go through dialysis, which is indicated the construction of arteriovenous fistula. Patients with creatinine clearance less than 15 ml/min. This is called the stage of renal failure. Below 15-10 ml/min rim no longer plays the basic functions and the initiation of dialysis is indicated. There patients begin to experience symptoms of kidney failure called uremia. Although still unable to urinate, the volume is not as great and the patient begins to develop large swellings. Blood pressure is uncontrolled and potassium levels in the blood are elevated to the point where they can cause cardiac arrhythmias and death. The patient has lost weight and cannot eat very well. Sit nausea and vomiting, especially in the morning. Gets tired easily and anemia usually is at dangerous levels. If dialysis is not started the disease progresses, and those who do not go to death from cardiac arrhythmias can develop mental changes such as confusion, seizure and even coma. When held ultrasound kidney, these normally have already withered, reduced in size. Some patients can get to stage 5 with few symptoms. These are the hardest to convince to go on dialysis. Despite the fewer symptoms they present numerous laboratory abnormalities, and the longer delaying the start of dialysis, the worse will be the bone lesions, cardiac, malnutrition and the risk of malignant arrhythmias. Often the first and only symptom of kidney failure is sudden death. Chronic renal failure is a silent disease that has become increasingly common in our country where diabetes and hypertension affect more and more individuals. The determination of creatinine in the blood and nephrologist follow-up are essential to better control this disease.